Kuftstein to Innsbruck – 156.2 km. Soon after crossing the river, the riders enter Terfens. This is where the first major struggle of the day begins. The following 2.6 km kick up with a staggering average gradient of 10.5 % and include a section of 500 meters with over 13 %. Most likely, the first big selection will be made here. From the top in Gnadenwald, 15 km remain before the riders cross the finishing line for the first time to take on the 23.9 km long loop around Innsbruck. From the top of the climb, a fast descent – also on good wide roads – brings the riders back to the city center of Innsbruck. On paper, this final part of the course looks flat but that’s not exactly the case. After crossing the river with about 4 km to go, the riders continue straight-out into a very narrow street. From here on, the next 400 meters are uphill with 7 %. It peaks at 11 % towards the top. This is the last chance for the punchy climbers to get away. Afterwards, a short descend leads the riders back to the river, which they will cross again with about 1.5 km to go to take on the last well-known stretch towards the finishing line. The elite women will do three laps on this 23.9 km circuit. 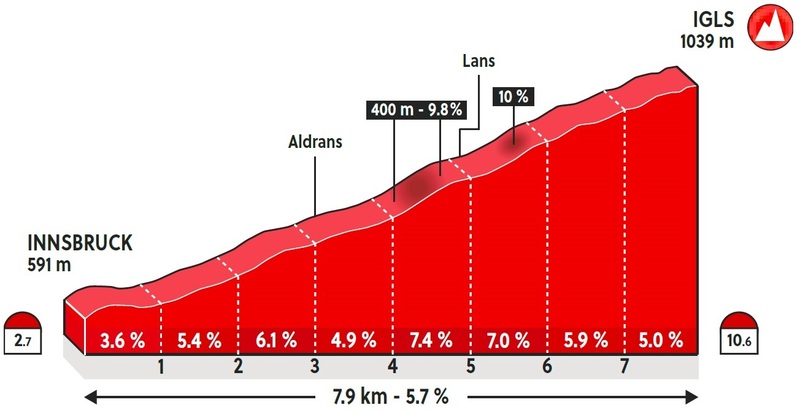 In total, throughout the day, it means they will have to overcome nearly 2500 meters of climbing. Given their track record and results throughout the season, the big favorites are to be found in the Dutch team with Annemiek van Vleuten and Anna van der Breggen. The latter has finished in the Top5 at the world championships multiple times and this mountainous course suits her perfectly. The same goes for Van Vleuten who has been in a league of her own this second half of the season, winning Giro Rosa, La Course and Boels Ladies Tour. In La Course, it came down to a nail-biting fight between the two Dutch women on the final meters. Van Vleuten ended up with the longest straw, just as she did in the time trial on Tuesday where she repeated last year’s performance to win the rainbow jersey – ahead of Van der Breggen. The Dutch team also have the current World Champion in Chantal Blaak but the mountainous course may prove too hard for her. The biggest opponents to the Dutch favorites may very well turn out to be themselves as we saw at the European Championship. With two such big names, it will be interesting to see how they are going to take on this race. It won’t be a surprise to see them make the race hard already on the short and steep climb before reaching the circuit. Then, on the final laps, we will find out if Van Vleuten and Van der Breggen can work together or not. Neither has ever won the rainbow jersey in the road race. After playing the roles of loyal teammates when Blaak managed to sneak away and win last year, both will be very eager to get into a position where they are at the front with a teammate backing off in the chase behind. Of the other teams at the start line, the Australians are probably the strongest adversary to the Dutch women. Amanda Spratt is their designated leader and she’ll be able to count on great support on the climbs from the likes of Shara Gillow and Lucy Kennedy. Both riders are also amongst the outsiders for a top result, depending on how the race evolves. Spratt is teammates with Van Vleuten on Mitchelton-Scott and she has been a key player in many of Van Vleuten’s big win this year. Especially in Giro Rosa where Spratt herself managed to finish third overall after helping Van Vleuten to win. All Spratt’s four victories this season have come after an impressive solo effort. If she first gets a gap on the final lap, it will be a tall order to bring her back. Speaking with Gillow ahead of the race, the Australian climber made it clear that the team is not afraid to take on the Dutch favorites and that Rohan Dennis’ win in the time trial has given the whole national team a big moral boost. “Everybody is on a high after that win”, she tells. “I’m really excited to start racing. A lot of us here go back a long way. We know each other very well and we know how to work together. Many things can happen at a World Championships race but we all know exactly what to do. The fact that the Dutch team is so strong may play against them but we are just going to focus on doing our own race and stick to our strategy. Personally, I feel great. We’re confident we can do well here”. While the other teams may not be as strong in numbers as the Dutch and the Australian ones, it doesn’t mean they don’t have any top candidates for the win. Italy has Elisa Longo Borghini, third at the mountainous Olympic race in 2016, while Poland will hope that Kasia Niewiadoma’s recent overall win in Tour de l’Ardèche means that she’s back at her best level again after a difficult season. When in peak condition, Niewiadoma is amongst the best climber in world. She’s not afraid to attack from a far and that makes her a very dangerous rider in any hilly one-day race. Denmark has built their team around Cecilie Uttrup Ludwig who impressed hugely in La Course with a daring attack on the final climb setting up her teammate for the podium, while still managing to finish fourth herself. Uttrup Ludwig won the UCI Women’s World Tour youth classification last year after a series of impressive performances. This year, she finished sixth in Giro Rosa. She’s primarily a climber but she’s not bad against clock either, meaning she has a good engine as well. Recently, she suffered from appendicitis, which could be the reason for the below-par result in the time trial. However, she’s extremely motivated to do well and this course really suits her. To help Uttrup Ludwig succeed, the national coach Catherine Marsal called up multiple MTB World Champion Annika Langvad to support the young Dane on the climbs and make sure she’s not isolated too early. It will be interesting to see how long into the final Langvad can stay with the best riders. This hilly route definitely favors her. For other outsiders who should be able to do well on this course, look to Jolanda Neff (Swiss), Dani Rowe (UK), Margarita Garcia and Eider Merino (Spain), Arlenis Sierra (Cuba) and the American duo of Megan Guarnier and Katie Hall. South Africa’s Ashleigh Moolman-Pasio is also a serious candidate for such a hilly race. Unfortunately, she’s all alone and will have to rely on the other teams to chase at the right moments. On the climbs, few will be able to drop the 32-year-old climber. She has had a great season with overall podiums in Setmana Ciclista Valenciana, Flèche Wallonne, Giro Rosa and La Course but she’s still missing that one big win. Moolman-Pasio is always there or thereabout when it really counts. A podium place is definitely within her reach and it won’t be a big surprise either to see her with the rainbow jersey at the end.